Order two matching benches and a table to create your own cozy kitchen booth! Booth seating is a great idea for game rooms or hang out rooms for teenagers as well. Everyone will love the cozy, inviting booth seating! Face two benches together or create a corner nook, either way this Breakfast Booth will make you kitchen the place to be. Handcrafted from solid wood and your choice of finish, you can be sure this breakfast booth with complete your kitchen. Our Amish Craftsman are sure to pay extra attention to detail to ensure superior durability and quality. 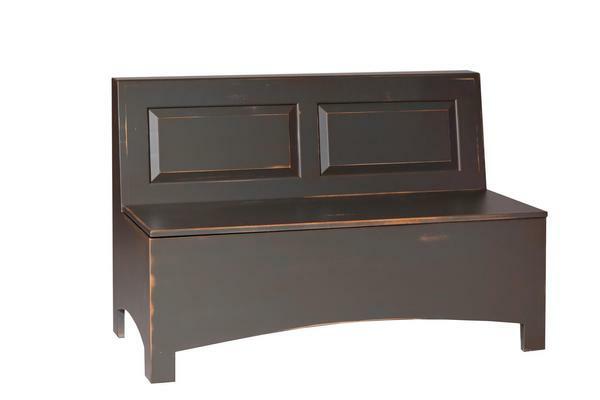 Each piece is built to order, so choose between of 32" storage bench, 50" storage bench or call one of Amish Furniture Specialist to request a quote for a custom size to fit your space. Guess what? You also have handy storage inside the bench seat for table linens or games! If you love all the pieces to this set, check out the Trestle Table Corner Breakfast Nook Set. This booth bench is perfect for restaurant seating or residential use. We are happy to provide you with a quote for your project. Safety hinges on the lids of the storage benches. Built to go against a wall - backs of the nooks will have nail pocket holes,etc. Call one of our Amish furniture specialists for a custom finished back.